“Currently Unavailable Online” and “Sold Out” are the messages that parents are greeted with as they search online for merchandise related to Disney’s “Frozen”. The site Jezebel posted a very honest and blunt article this week (warning: there is some foul language) about angry parents taking to The Disney Store’s Facebook page to vent their frustration at not being able to locate Anna and Elsa products. Anna and Elsa dresses and dolls are being sold on Ebay with a markup of several hundred dollars. The supply is not meeting the demand right now, and Disney is working feverishly for a resolve. I have to admit that I was not fully aware of this issue until our trip in Walt Disney World trip in March, when we scoured several stores for princess dresses for friends. The first place we looked was Castle Couture; a store in the Magic Kingdom’s Fantasyland that carries princess dresses. The place was swarming with people and cast members were at the ready to tell people that they were completely out of stock. They had just received a shipment the day prior and were immediately sold out. We were given some advice on where else in the resort to look for dresses, and knew at this point that this was going to be an adventure. As we were shopping on Main Street U.S.A. later that day, we saw a bunch of people in the back of the store around a rack. We noticed there were a few Anna dresses (no Elsa dresses at all) and I went over to get in on the fury. They did not have the size we needed, so we asked a cast member if there were any other dresses in stock, and she was able to locate one in the stock room. The following day we were in the Norway Showcase at Epcot shopping at the Puffins Roost at just the right time. There in front of us was a cast member guarding a stack of Elsa dresses that were still in the packaging. It seems that finding these dresses was just a “right place at the right time” scenario. The priority for “Frozen” merchandise seems to be that the items are sent to shops at both Walt Disney World and Disneyland. The Disney Stores do get shipments of dresses; however they are less frequent and sometimes gone before they even hit the rack. The Disney Store has been answering “Frozen” merchandise questions on their Facebook page with responses that give a late April and May timeframe for more related items. New merchandise went up on The Disney Store’s website midday on Tuesday and most of the coveted items were sold out in a matter of hours. Ask your friends if they have a scheduled trip to one of the Disney resorts. They may be willing to pick up some merchandise for you from the parks. The stores that I know definitely do receive the stock per information from cast members are Castle Couture and Disney Clothiers at the Magic Kingdom, Puffins Roost at Epcot and World of Disney in Downtown Disney. The Disney Store currently has several style of t-shirts available in limited sizes. You could also call your local Disney Store to inquire about the merchandise and ask when the items will be stocked and delivered. The stores are getting very limited quantities of t-shirts and dresses. Walmart is also carrying merchandise including t-shirts and toys that are posted online sporadically. One of the t-shirts posted this morning was sold out while I wrote this article. Call the Walmart in your area to check on availability. Sometimes they carry items in the store that are completely sold out online. 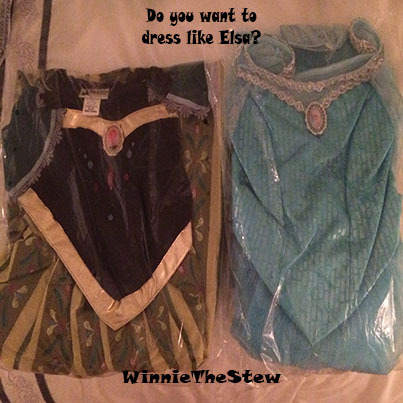 Target and Toys R US are both selling variations of the Elsa and Anna dresses. While sold out online, I did see an Anna dress at Target the other day. The quality is pretty terrible and the material is really bad and scratchy, but if you are in need of a dress quickly, this may be an option. Call the stores prior to driving there since these dresses are highly in demand. Acme (a division of Albertson’s) had racks of Disney brand “Frozen” shirts in various sizes in two grocery store locations that I visited last week. Etsy sellers are posting “Frozen” inspired merchandise like shirts, dresses and jewelry. Some of the outfits are absolutely stunning and are made with high quality materials so they are more comfy than the mass-produced dresses. Just like Elsa’s self-created winter storm….this too shall pass. Hopefully we will be seeing more and more merchandise in the coming months.